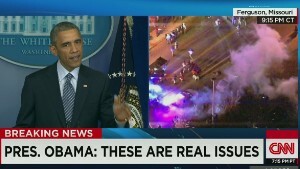 Obama: "We need to accept this decision was the grand jury's to make"
Ferguson, Missouri (CNN) -- The announcement of a grand jury's decision not to indict Ferguson police Officer Darren Wilson in the shooting death of unarmed teen Michael Brown was met with chaos Monday night. 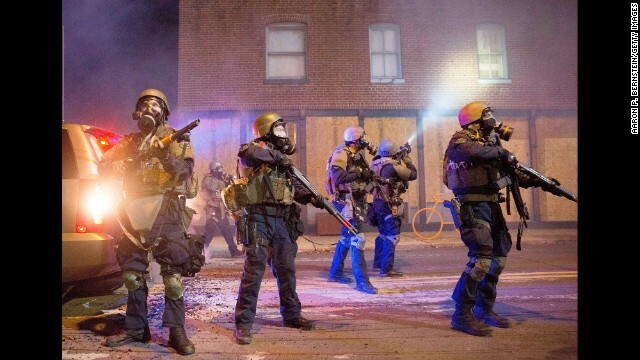 While many of the protesters were peaceful, more than 15 gunshots were heard as businesses throughout the city were looted or set ablaze. 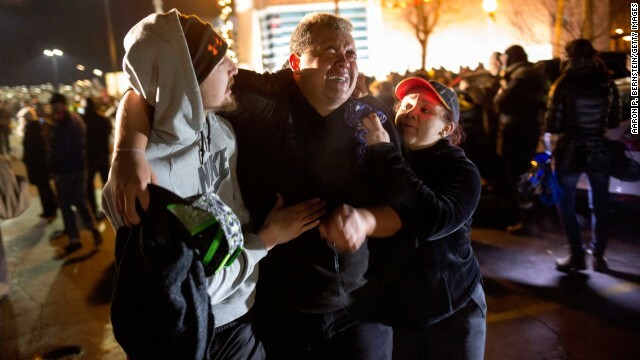 The violence marred the wishes of Brown's parents, who have been pleading for peace. "This is crazy. 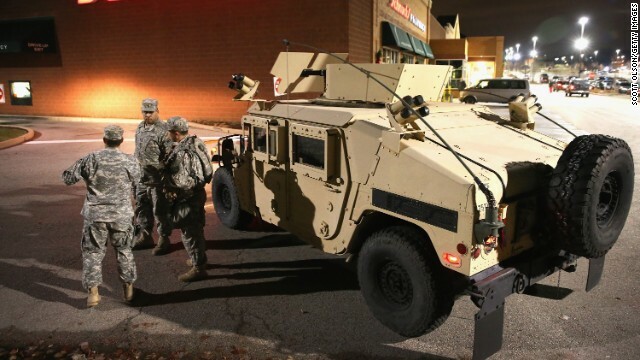 I mean, this doesn't do anything," one resident told CNN. She worried about how her city would pick up the pieces. "They're not going to rebuild. 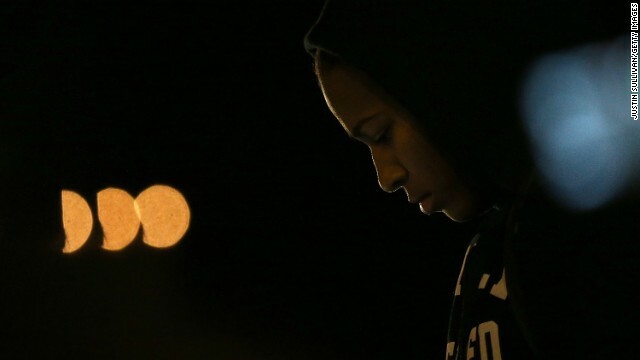 It's just going to be a ghost town pretty soon." 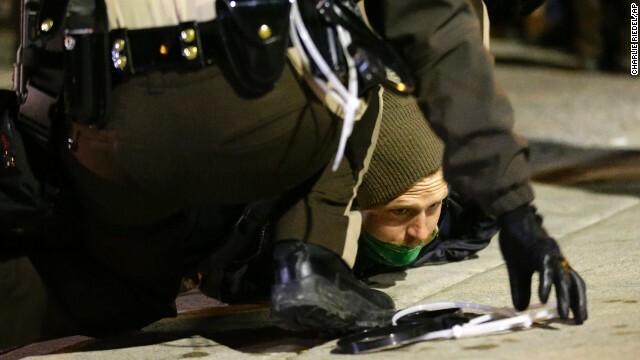 Police made 29 arrests amid the protests and violence, St. Louis County Police said. 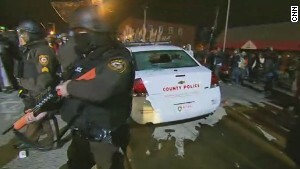 The police chief said he heard at least 150 gunshots, but authorities said police did not fire at anyone. 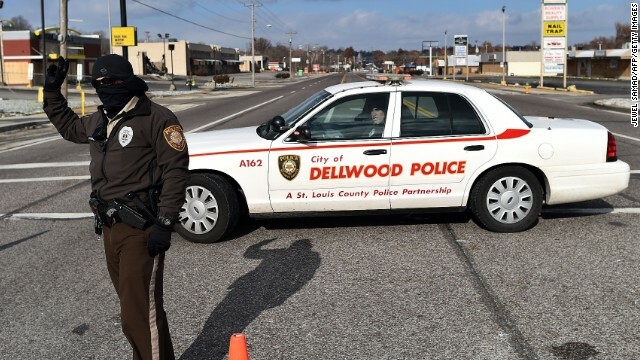 No police have sustained any serious injuries, St. Louis County Police Chief Jon Belmar said. He said to his knowledge, police have not caused any serious injuries. Several businesses and a row of cars at a car dealership have been set ablaze in the nearby city of Dellwood. 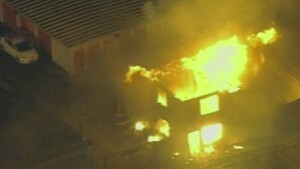 The city's mayor said firefighters are unable to respond to one major fire because of gunshots ringing out. Gov. 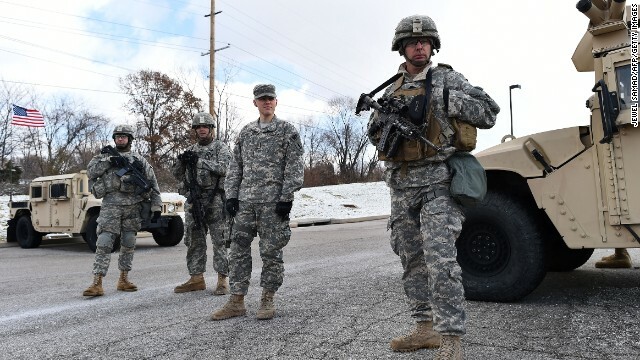 Jay Nixon has ordered more Missouri National Guard members to Ferguson. 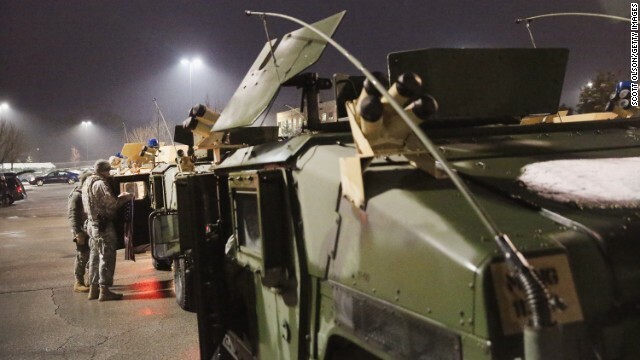 The Guard is providing security at the Ferguson Police Department, Nixon's office said. 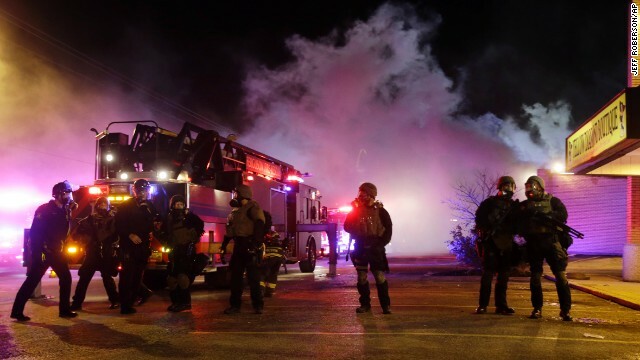 Firefighters responding to a business engulfed in flames left the scene after gunfire rang out, CNN's Stephanie Elam said. They have not returned. 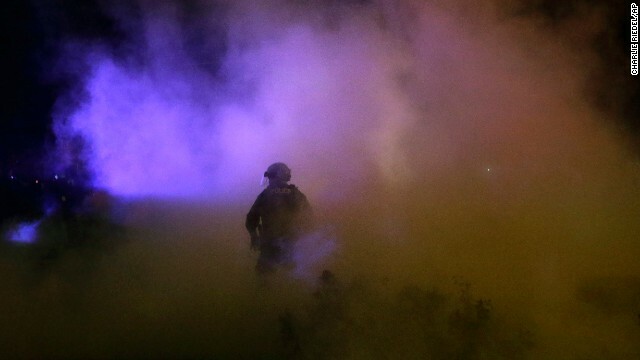 Due to reports of gunshots fired into the sky, the Federal Aviation Administration has issued a temporary flight restriction over Ferguson, Missouri until 4:15 a.m. Tuesday morning. Only law enforcement aircraft will be allowed to fly in the zone, and media aircraft are flying just above the zone, the FAA said. 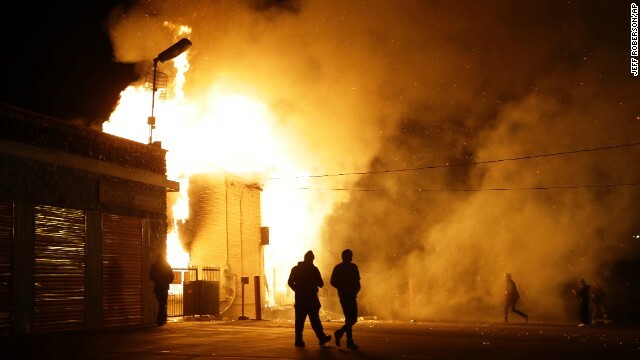 An entire row of businesses are now on fire on West Florissant Avenue, a major street in Ferguson, Missouri. 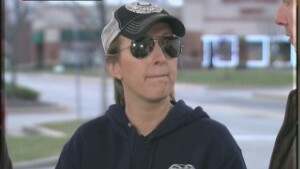 There are so many fires in the city that firefighters haven't been able to reach all of them, CNN's Sara Sidner said. St. Louis' main airport has a temporary flight restriction, according to a tweet from Lambert-St. Louis International Airport. The restriction is for incoming flights, not outgoing, according to the airport message. 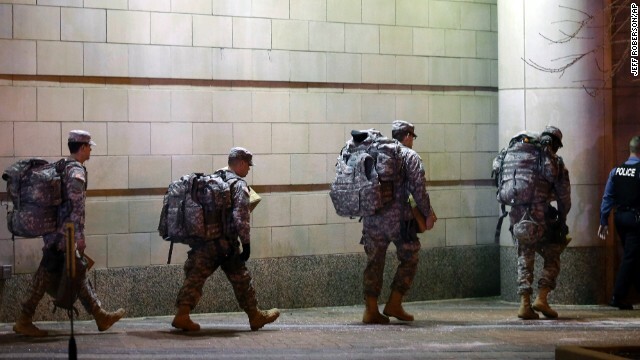 "It is affecting just a handful of remaining flights that are due in," spokesman Jeff Lea told CNN. 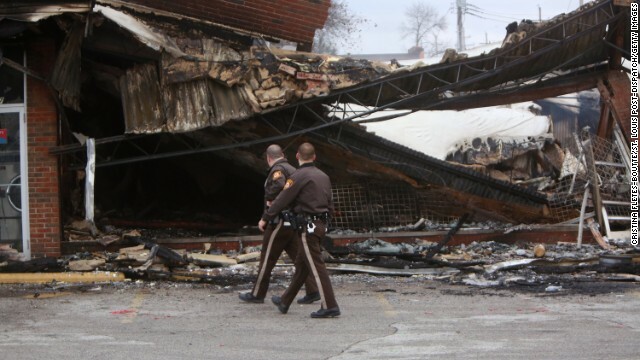 Several more businesses are being looted or set on fire in Ferguson, Missouri. 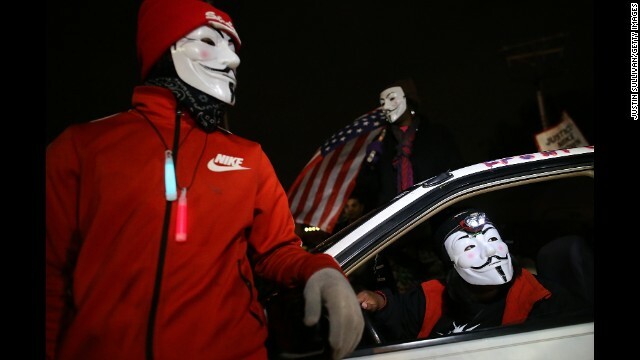 Meanwhile, protesters have shut down Interstate 44. 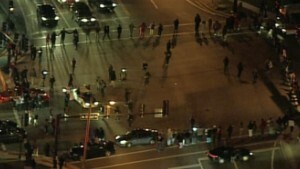 Police officers are now standing in a line across highway lanes. 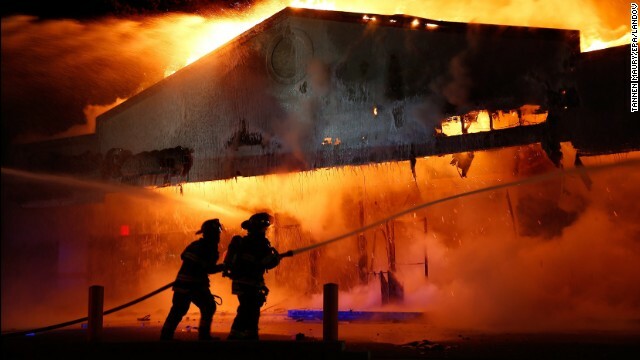 A Little Caesars pizza restaurant has been set ablaze as chaos continues to mount throughout Ferguson, Missouri. 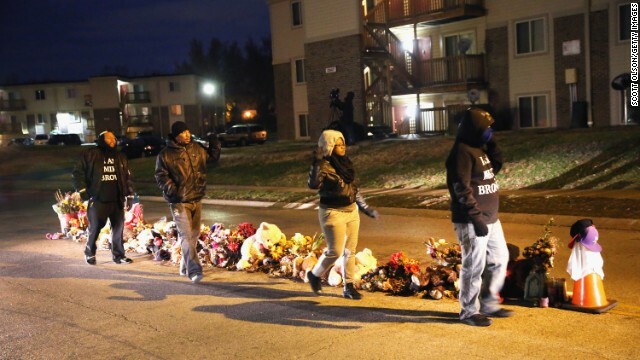 "What is so tragic is this is exactly what the parents of Mike Brown did not want," CNN commentator Van Jones said. 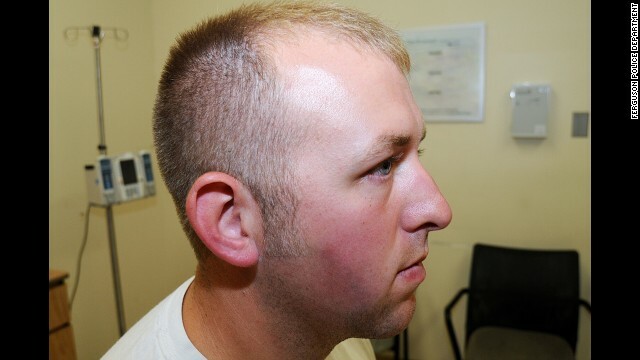 Officer Darren Wilson told a grand jury that Michael Brown punched him in the face when he drove back to him after identifying him as a possible suspect in a shop theft, according to documents released by St. Louis County Prosecuting Attorney Robert McCulloch. He said he tried to get out of his cruiser, but Brown slammed the door shut twice and hit him with his fist. 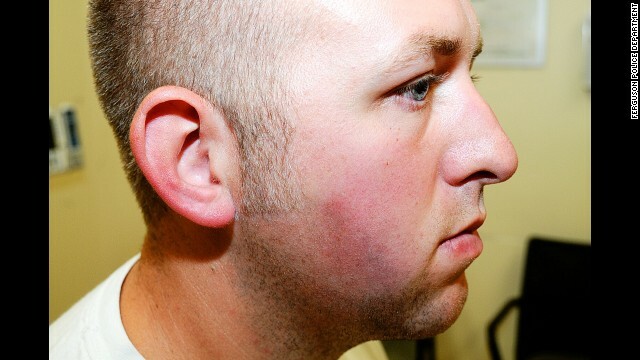 "I felt that another of those punches in my face could knock me out or worse," Wilson said. "... 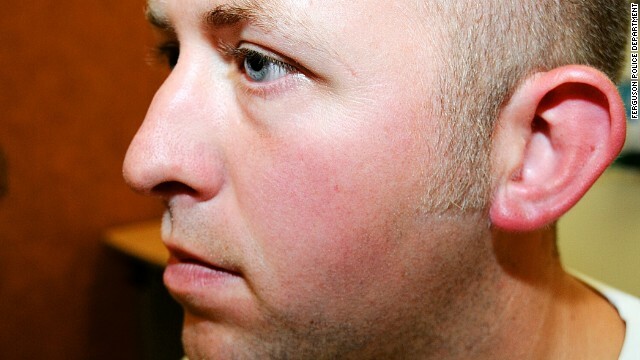 I've already taken two to the face and I didn't think I would, the third one could be fatal if he hit me right." 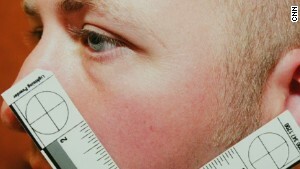 Another photo taken on the day of Wilson's altercation with Brown. It appears all the names of witnesses have been redacted in the court documents. 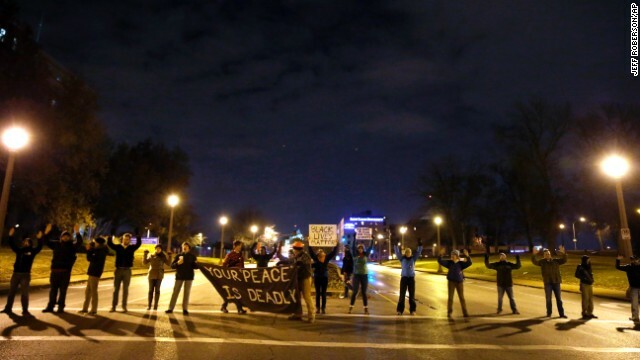 "Right now all hell is breaking loose," St. Louis blogger Aaron Laxton said. 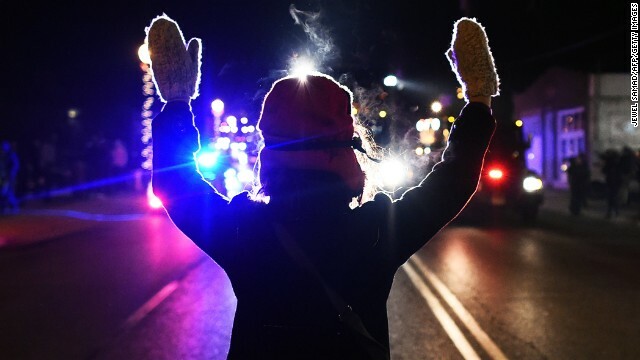 Protests have started across the country, including in New York, Chicago and in front of the White House in Washington, following a grand jury's decision not to indict Ferguson police Officer Darren Wilson. 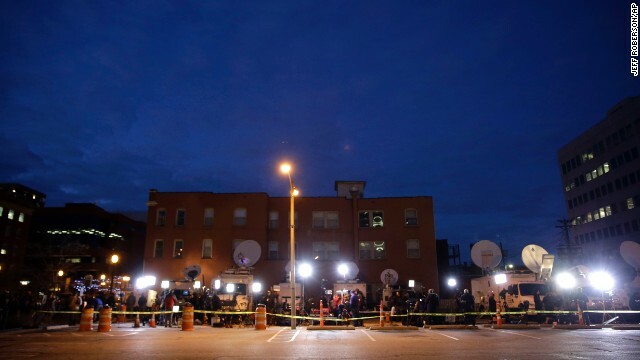 A few protesters hurled items at CNN's Stephanie Elam, and some said they did not want the media reporting on the unrest in Ferguson. Attorney General Eric Holder stressed that the federal civil rights investigation into the shooting death of Michael Brown continues. "Even at this mature stage of the investigation, we have avoided prejudging any of the evidence," Holder said. " And although federal civil rights law imposes a high legal bar in these types of cases, we have resisted forming premature conclusions." 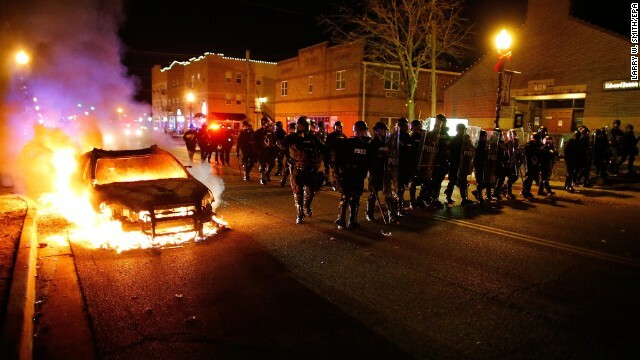 The violence that has broken out in Ferguson following the grand jury's decision to not indict Officer Darren Wilson is not what the Brown family wanted, family attorney Benjamin Crump told CNN. 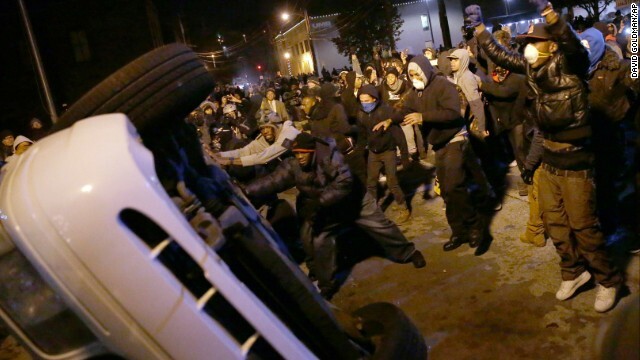 "They wish that people will not be violent" but be peaceful and constructive, he said. 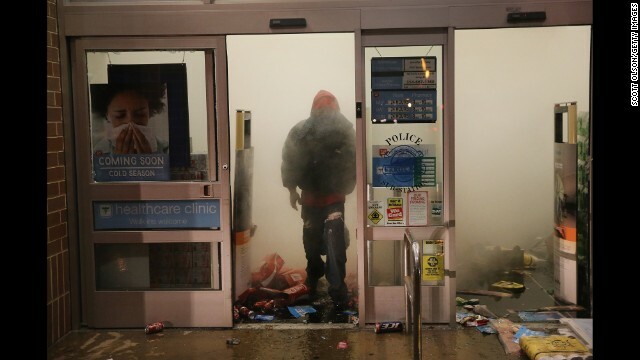 Ferguson Market & Liquor -- the same store where Michael Brown had allegedly stolen cigars before his confrontation with Officer Darren Wilson in August -- was being looted Monday night, CNN crews reported. 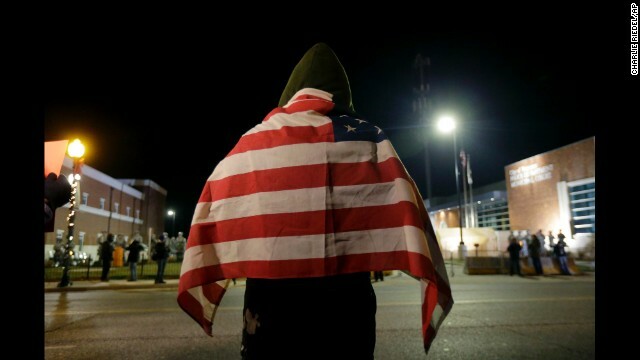 A grand jury decided not to indict Ferguson police Officer Darren Wilson in the shooting death of Michael Brown, setting off fresh confrontations between protesters and police in the tense Missouri city Monday night. 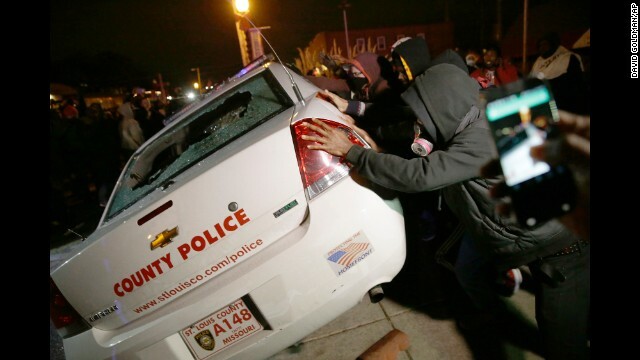 While most of the protesters were peacefully assembled on the streets of Ferguson, some protesters smashed the windows of a police cruiser and tried to overturn it, CNN's Jake Tapper reported. 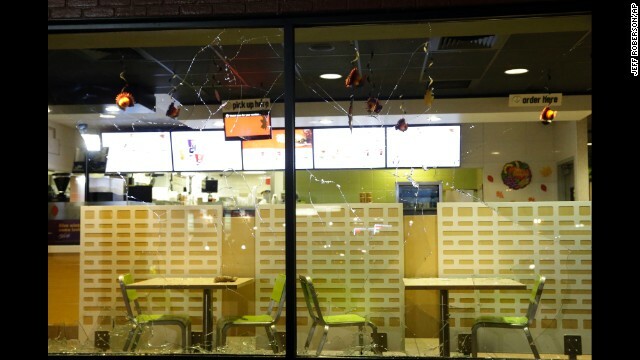 Some picked up bricks and smashed the windows of a restaurant. 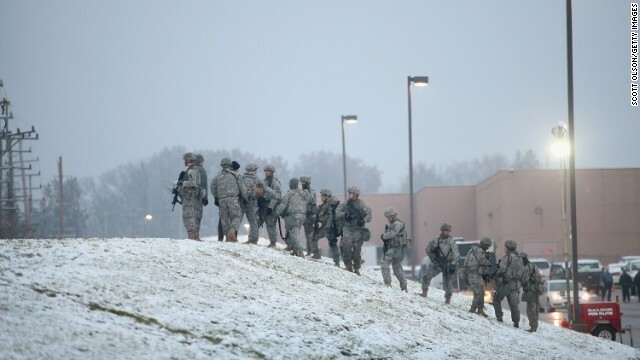 Several gunshots were heard, CNN teams on the ground said. 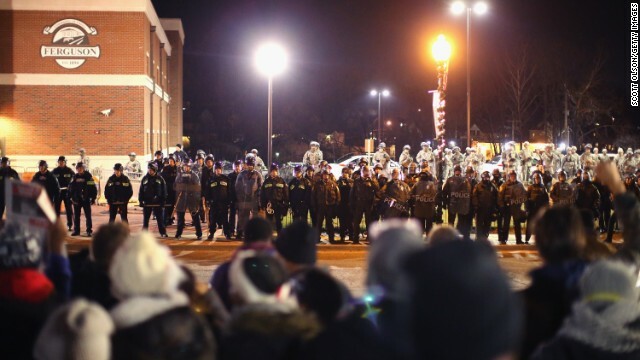 Some protesters rushed the officers lined up in front of the Ferguson police department. 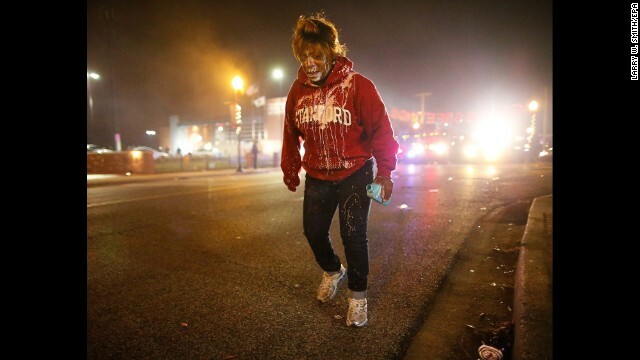 Some in the crowd told the agitators to stop throwing bottles, but their urgings fells on deaf air. 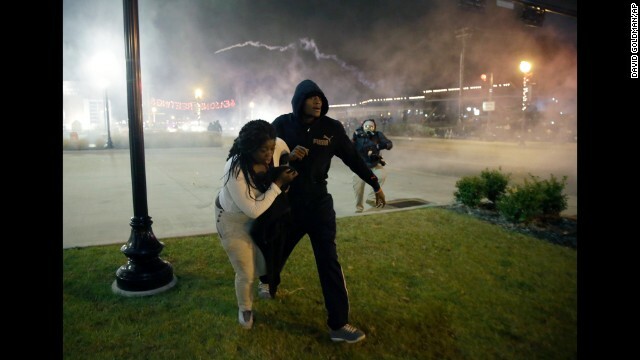 Police responded by lobbing tear gas, even though they said they were smoke pellets. 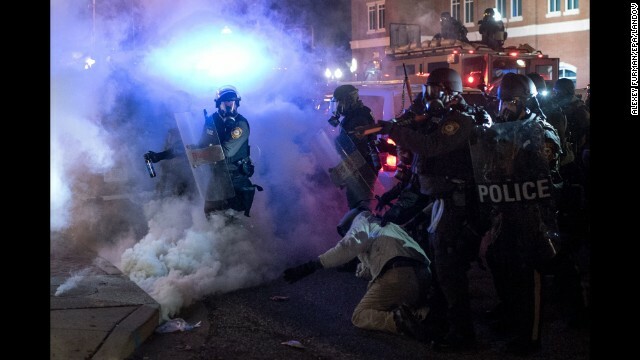 One protester named Angel told CNN that a woman in the crowd had a heart attack, and as several people tried to carry the woman away, they were tear gassed. In the distance, a police cruiser was on fire. 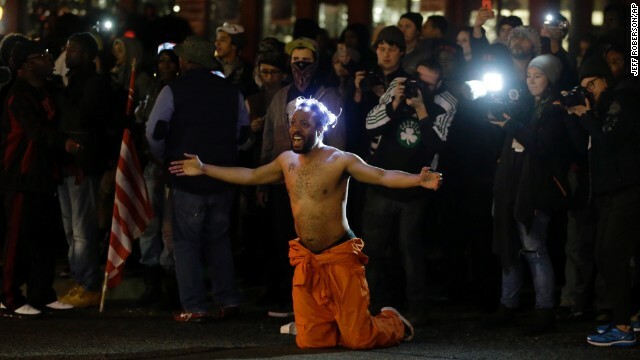 Fearing just such a reaction, Brown's father had urged demonstrators earlier to remain calm no matter what the grand jury decided. 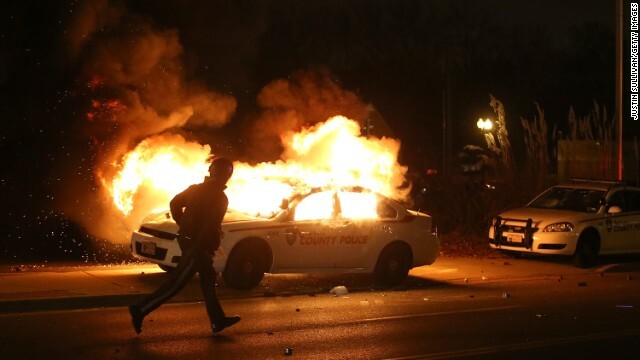 "Hurting others or destroying property is not the answer," Michael Brown Sr. said. 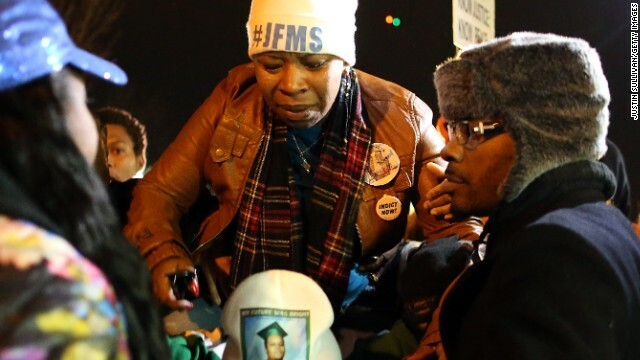 "No matter what the grand jury decides, I do not want my son's death to be in vain. I want it to lead to incredible change, positive change. 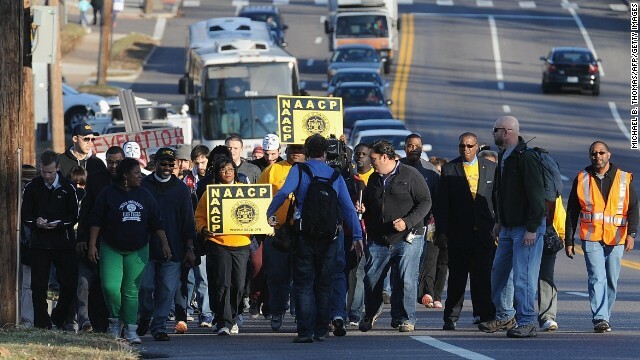 Change that makes the St. Louis region better for everyone." 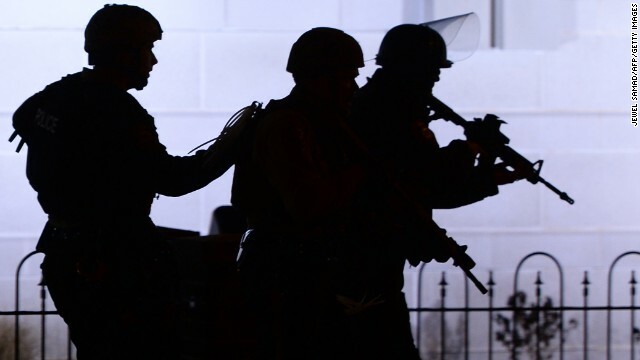 Brown Sr.'s words were echoed by President Barack Obama who too called for calm. 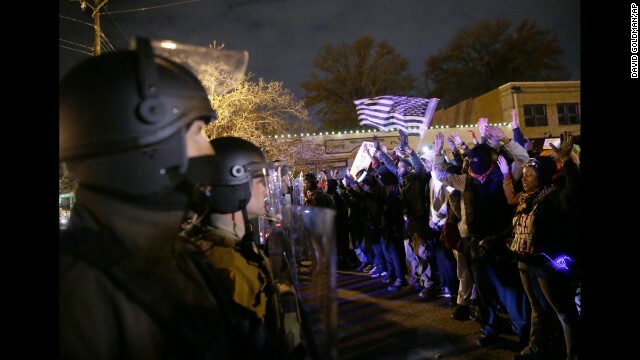 It is an "understandable reaction" that some Americans will agree and others will be made angry by the decision to not indict Wilson, Obama said Monday night. "First and foremost, we are a nation built on the rule of law, so we need to accept this decision was the grand jury's to make," he said. 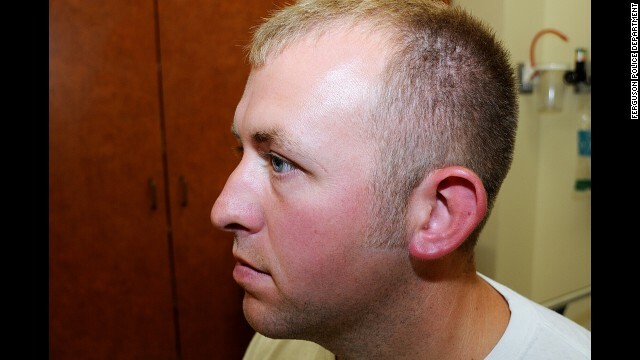 What's next for Darren Wilson? 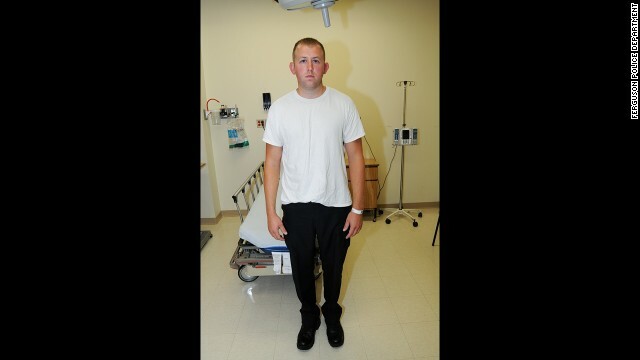 Wilson, a white police officer, shot and killed Brown, a black teenager, on August 9. After an "exhaustive review," the jurors deliberated for two days, he said. The grand jurors are "the only ones who have heard all the evidence," St. Louis County Prosecuting Attorney Robert McCulloch told reporters. "The physical and scientific evidence examined by the grand jury, combined with the witness statements, supported and substantiated by that physical evidence, tells the accurate and tragic story of what happened," he said. 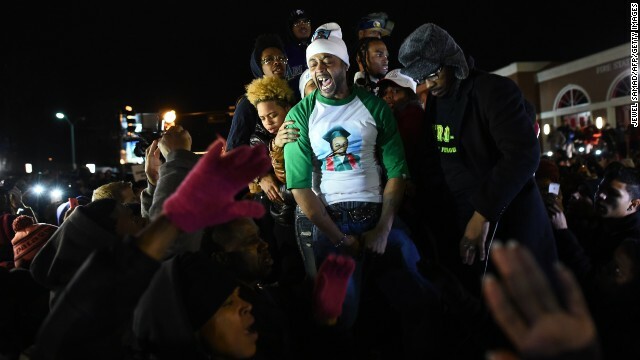 Brown's father is "devastated" that Wilson will not face charges, a spokeswoman for Michael Brown Sr. told CNN's Evan Perez. 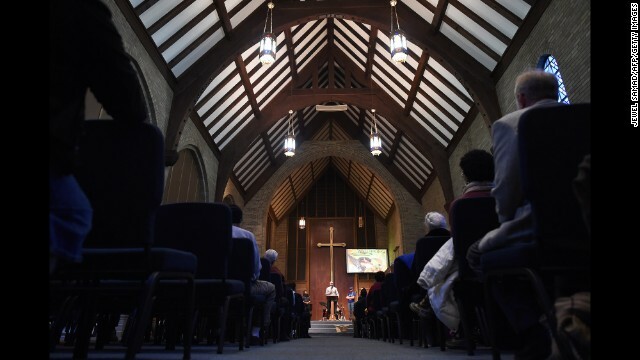 "While we understand that many others share our pain, we ask that you channel your frustration in ways that will make a positive change," the family said in a statement. "We need to work together to fix the system that allowed this to happen." The family made a call for police officers across the country to wear body cameras. The statement closed: "Let's not just make noise, let's make a difference." Through a statement issued by his attorneys, Officer Wilson expressed thanks to those who have "stood by his side" since the August 9 shooting of Michael Brown. 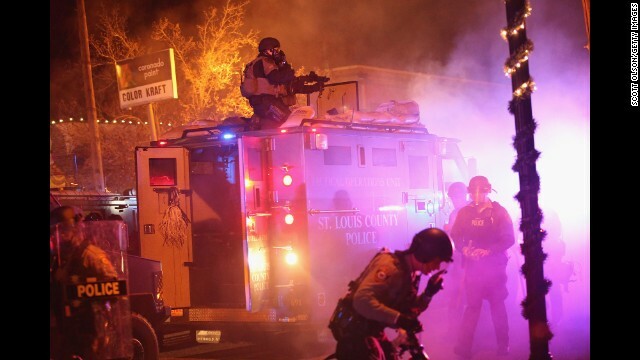 "Law enforcement personnel must frequently make split-second and difficult decisions," the statement said. 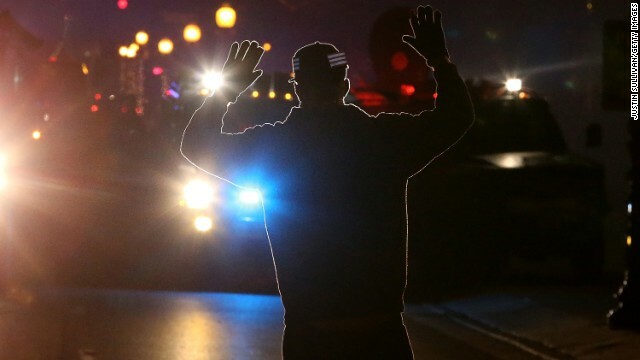 "Officer Wilson followed his training and followed the law." 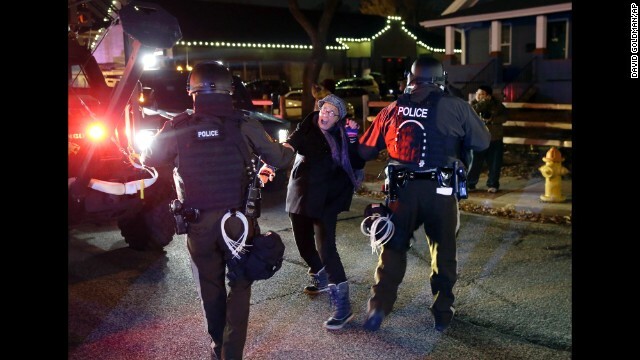 Earlier Monday, officials urged residents to remain calm -- regardless of the grand jury announcement. "No matter what is announced, people will be emotional. 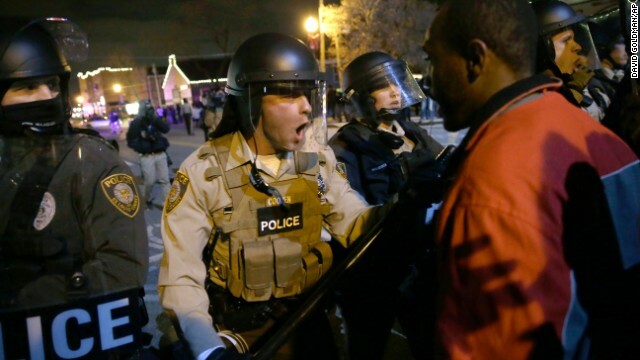 I want people to think with their heads and not with emotion," said St. Louis County Executive Charlie Dooley. "This is not the time to turn on each other. It is a time to turn to each other." 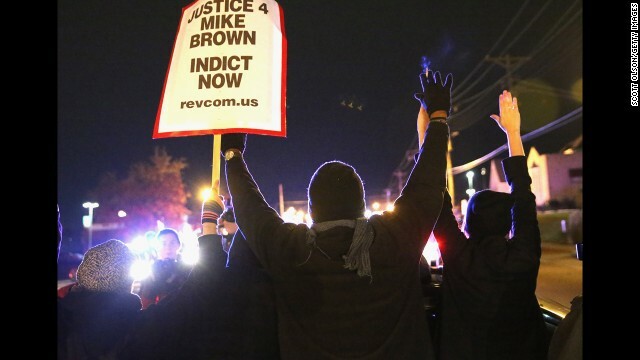 Brown's death ignited a national debate on race and law enforcement. 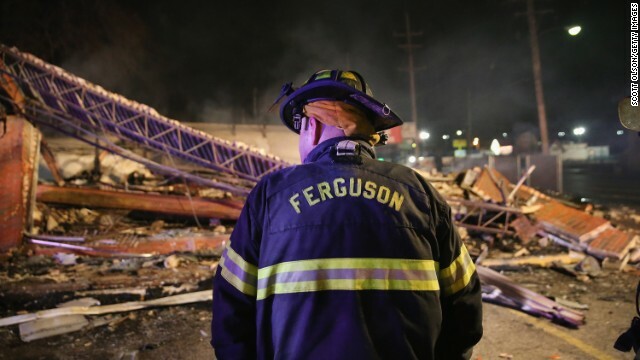 Nowhere was the tension more evident than in the predominantly black town of Ferguson, which has a mostly white police department and town government. 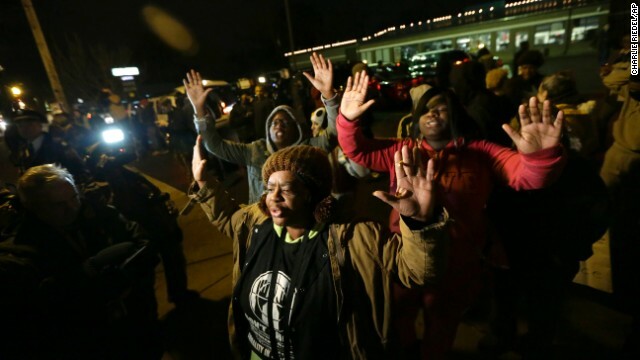 Supporters of Brown's family back witness accounts that Wilson fired while Brown, 18, had his hands up in surrender. Wilson's supporters say that Brown was the aggressor and had tried to take Wilson's gun while he was in his vehicle and that the officer fired in self-defense. 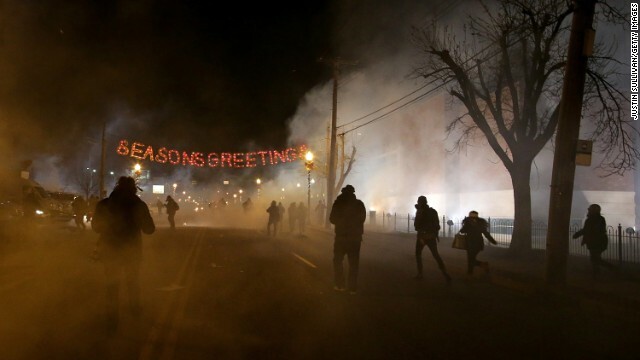 The town couldn't even agree what happened during weeks of street demonstrations. 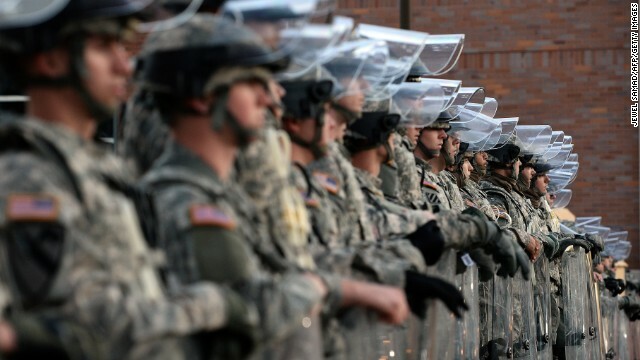 Protesters argued that authorities were trying to stifle protests; officials said they were acting to keep violence under control. 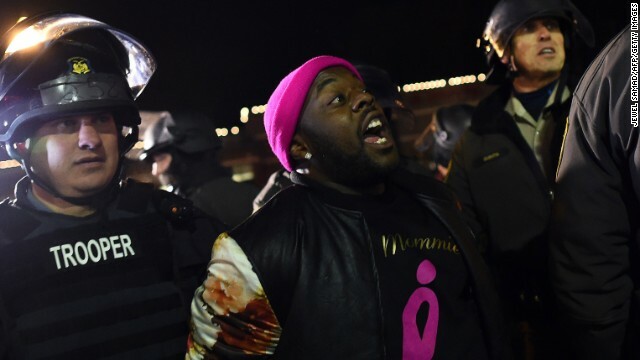 Byron Conley, protesting outside city police department, told CNN before the grand jury announcement, "We're just ready for it to be over with. Let's get on with our lives." Rick Canamore stood with his sign -- "RIP Mike Brown" -- outside the police department. 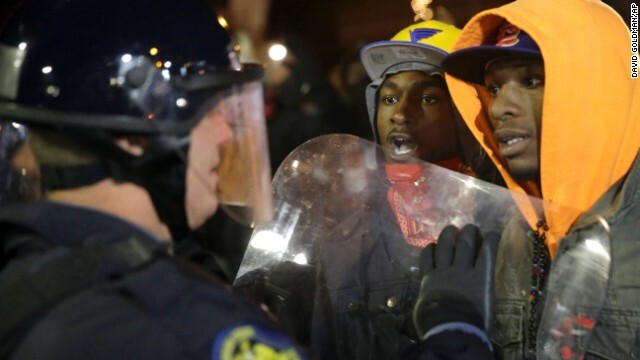 "I'm already angry because it has taken so long," he said. 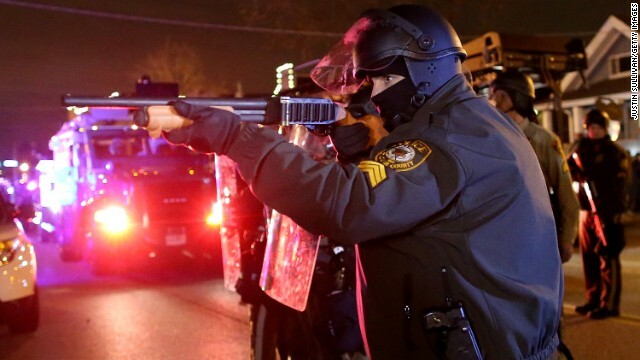 "If Mike Brown had shot Darren Wilson, it would have been over a long time ago. 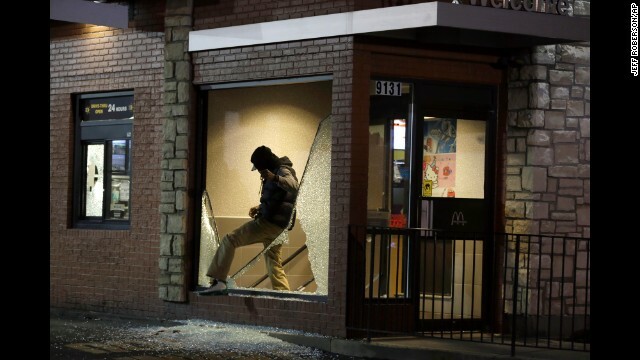 But Darren Wilson is walking around free. 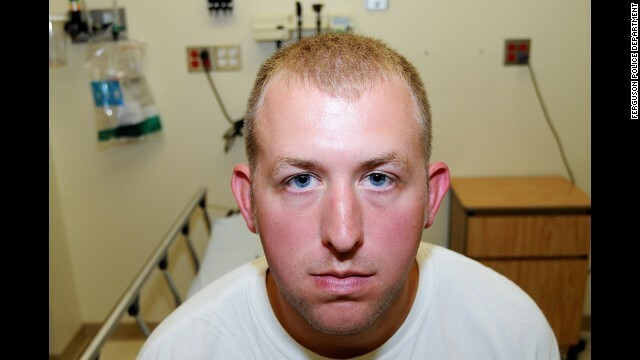 He hasn't apologized to Mike Brown's family. 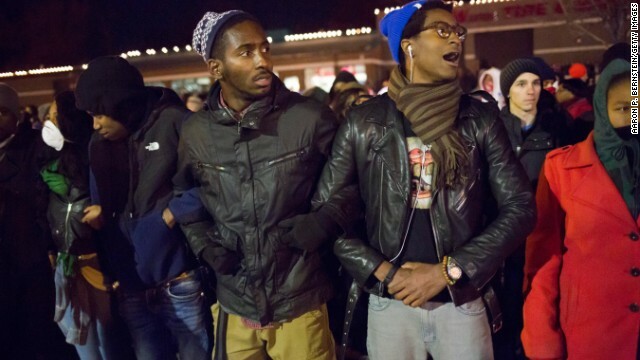 He has not apologized to the community." Though the basic facts of the case -- that Brown was unarmed when Wilson shot him -- are not in question, the facts of the fatal moment are hotly disputed. Authorities have said Wilson stopped Brown because Brown and a friend were blocking traffic, by walking down the middle of the street. 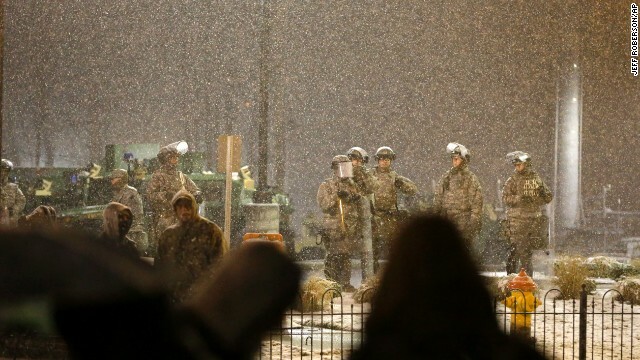 Protests in Ferguson might be hampered by winter weather, with temperatures expected to drop into the upper 20s Monday night. Unlike a jury in a criminal case, which convicts someone if jurors are convinced of guilt "beyond a reasonable doubt," a grand jury decides whether there is "probable cause" to charge someone with a crime, based on testimony and evidence presented. In Missouri, grand jurors don't have to be unanimous to indict, as long as nine of the 12 agree on a charge. The grand jury could have issued an indictment on any of these four charges: First-degree murder, second-degree murder, voluntary manslaughter and involuntary manslaughter. It also could have added a charge of armed criminal action, authorities said. 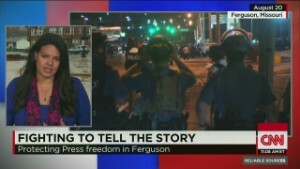 Moni Basu reported from Ferguson. 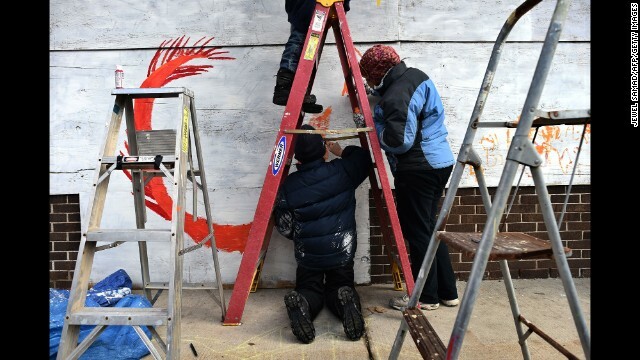 Holly Yan and Dana Ford reported and wrote in Atlanta. CNN's Rachel Clarke, Ralph Ellis, Steve Almasy, Evan Perez and Josh Levs also contributed to this report.